It’s November 1966, and Doctor Who is in a very different place than where we left it. In the 18 months since our last story, the show has gone through a series of significant changes in producers, script editors and cast members, shedding about a third of its audience in the process. But none of these has been as traumatic and risky as the change that happened at the end of the previous episode, The Tenth Planet, in which the Doctor, his body worn out, collapsed and transformed in front of us into a new and unknown character. It’s hard, at this late stage, to find much to say about The Power of the Daleks that hasn’t been said. Everyone knows it’s Doctor Who’s most important make-or-break story until 2005. That said, the introduction of the new Doctor is handled as safely as possible. Sydney Newman got involved in the casting decisions and a well-respected character actor was chosen in much the same way that Peter Davison would later be a safe option to take over from Tom Baker. After 18 months’ absence, David Whitaker, the show’s original script editor, was brought back to write the transition story. And the Daleks also return after 10 months off the screen (their longest absence since 1964). In short, everything about the making of this story shows a production team careful to mitigate the impact of losing their leading man. And on the surface, the changeover was successful in boosting the ratings of a show that had been in decline throughout 1966, pretty much since February when, in the aftermath of The Daleks’ Master Plan, viewing figures went into a steady decline. The first episode of The Power of the Daleks was watched by 7.9 million viewers, the show’s best performance since The Celestial Toymaker in April. And the improvement was sustained across the remainder of the fourth season. 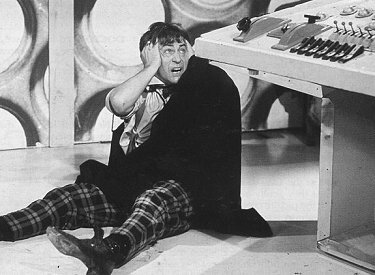 The average ratings of the four months prior to The Power of the Daleks were 5.3 million viewers. In the four months after they jumped to 7.7 million. For some reason, the last block of Hartnell episodes was not bringing in audiences – which suggests that on top of all the behind-the-scenes concerns regarding Hartnell’s increasingly difficult behaviour, there was a very obvious drive to visibly renew the show and hopefully bring back audiences who had switched off in droves during the past six months. So, The Power of the Daleks is not just ringing the changes for the Doctor. It heralds a new approach to making the series, albeit one that’s been trailed by small tweaks like the removal of individual episode titles from The Savages onwards – helping to sign-post each new adventure as a discrete entity with its own “opening night”, and allowing viewers to know exactly how far through each one they were. After the prototypical base under siege story of The Tenth Planet – which still found time for scenes in Geneva and in space – Vulcan really is an isolated outpost, with its sabotaged communications room precluding any contact with Earth. And the story is set on a human colony in the near future, involving a struggle between rebels and the established order. Nowadays those elements sound like the most clichéd Doctor Who plots imaginable. But, with the arguable exceptions of The Space Museum and The Tenth Planet, they never crop up during the Hartnell era. In this power struggle, the Daleks are an insidious menace – an entirely unimaginable role for them in any previous story. But, as we have seen, in an odd way their power mirrors that of the Doctor, and, like him, they enter this story diminished: a strange, unknown quantity. And that’s true of The Power of the Daleks too: although we have the soundtrack, screen grabs and several clips, this is one of those tragically missing stories that’s just beyond our grasp, where we have to second guess what’s going on. There’s a lengthy TARDIS sequence at the beginning of the first episode which, presumably, is about Troughton making the Ship his own space, and which the audio and telesnaps can’t adequately recreate. That’s going to be an increasing issue as we go into the largely-missing Troughton years, which coincide with this new way of making the show and its growing reliance on the grammar of action TV. Then there’s the new Doctor himself. As Ben says, “It’s not just his face that’s changed, he doesn’t even act like him.” The Hartnell Doctor took a delight in seeing the spectacle of the universe, always wanting to know what was on the other side of the hill. The Troughton Doctor knows that it’s something horrible, something evil. The child-like delight is still in there, but this is a darker, more suspicious character, hovering ominously at the edges rather than marching boldly in. In many ways Whitaker is taking the show back to its origin, with the Doctor a mysterious, even dangerous presence and the audience identifying with his two human companions, snatched from contemporary Earth and not entirely trusting his motives. But, crucially, whereas the first Doctor was wrong to fear Ian and Barbara, Whitaker makes this new Doctor right to be suspicious. His dire warnings invariably come true. Here, Lesterson has been prying into corners of the universe that should have been closed off, and unearthing things that should have been forgotten. Like the protagonist of an M.R. James story, his crime is intellectual pride and curiosity, and his punishment is to unleash a demonic evil whose retribution is disproportionately cruel. That’s a huge shift for the show: from the universe of wonders of the Hartnell years, to a universe of terrors for Troughton. Base under siege doesn’t just describe most Troughton stories – it’s an appropriate description for the whole tone of the era, where Earth and humankind are now besieged and at the mercy of terrible things from the cold, dark corners of the universe. That cosmic paranoia and creeping horror is going to be the norm for the show for most of the rest of its existence, and whether he’s visiting Earth or exiled there, from now on the Doctor is going to have to protect us.